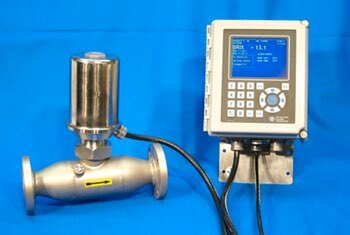 The MPR E-Scan is perfectly suited for sugar applications. The refractometer directly measures dissolved solids, which can be easily converted to Brix. In sugar refineries, the MPR E-Scan can be used to monitor and control Brix measurement from the beginning of the evaporation stages up to the seed point of crystallization. The suggested adapter for most installations is either a 316S/S in-line type adapter or a 316S/S vacuum pan adapter. If coating may be an issue, a steam or hot water wash nozzle can be provided. Sanitary-type adapters designed and manufactured to appropriate 3-A Sanitary Standards are also available if needed.